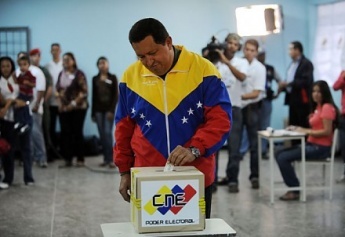 Merida, September 26th, 2010 – More than 11 million Venezuelans voted today, electing 165 legislators to the national assembly and 12 to the Latin American Parliament, in 36,553 voting centres across the country. The PSUV won a majority of positions, but not the two thirds necessary for some decision making. The government’s party the United Socialist Party of Venezuela has the largest number of legislators elected to the new assembly, with 95. Seven positions have yet to be defined. In the Latin American Parliament, the PSUV achieved 5 representatives, with 46.62% of the vote, while the opposition (MUD) also won 5 representatives with 45.1% of the vote. The indigenous representative elected is from CONIVE. 11,204,679 people voted. Three legislative positions are also reserved for the indigenous community. 1 elected was from the Fundation for Integration and Dignfication, 1 was the Autonomous Movement of Zulia, and 1 was from CONIVE. The CNE reported that voter turn out was 66.45%, despite heavy rain in many regions of the country. One voting centre had to be re-located because of the rain, and the CNE (National Electoral Council) reported that local residents had helped out with the relocation and it had not caused problems. There have been no major incidents at voting booths, and voters have been patient, calm, ordered and enthusiastic. Voting centres remained open until 6pm or until there is no one else in the queue. At 6.30 Tibisay Lucena announced that only five voting booths, for technical reasons, had to change over to manual voting. At 2am the CNE made its first official results announcement. In the last parliamentary elections in 2005 the opposition abstained and as a result pro government legislators (PSUV, PPT, PCV) hold 147 seats. Venezuela Analysis will be regularly updating this article as more information comes in. Last updated at 3:50am Venezuela Time.